In November and December, we continued our travel to North America and began our studies of Living and Non-Living things, Vertebrates and Invertebrates, Birds and Mammals. We studied the Parts of the Horse and Parts of the Bald Eagle and made books. We also talked about Feelings and have a “Feelings Chart” where children can place their photo on which feeling they are having (happy, sad, excited, angry, etc.) in both Spanish and English. We constructed a Gratitude Tree and children made leaves of what they are thankful for in their lives. We began our Word Study with word families -at, -an, -ap and had fun making up words with these endings. We worked on 1:1 correspondence of our “teens”: 11-20 and on counting and reading numbers from 1-100 (those tricky transitional numbers 29, 30…39, 40…49, 50, etc.). We took walks to the Lafayette Community Center on Monday mornings and took lots of nature walks, bringing our clipboards, paper and pencils to draw and write what we saw. We finished our Skyhawks program with Coach Donut and started Yoga with Roxanna! We celebrated Kira’s birthday by making a card and singing Happy Birthday! She was so surprised! We practiced our Winter Welcome songs with the Ladybugs and Bumblebees every morning! We made wax votives by melting wax and dipping water balloons and putting flowers around them! They were beautiful as we walked into greet the families singing, “This Little Light of Mine” last Friday afternoon. We hope you enjoyed the program! In January, we will be traveling to Antarctica and studying Penguins and learning about Arctic and Antarctic animals, Reptiles, Chinese New Year and the 100th Day of School and continuing our Botany studies by learning about roots. Happy New Year Caterpillar Families! This month the Ladybugs learned about giving to the less fortunate through Nasrin’s donation jar which was a great success. We also learned about being thankful for what we have especially for our families. We celebrated a few birthdays in November and December and the Ladybugs are quickly maturing! In December we learned about Penguins and our new Practical Life materials. A few of the Ladybugs are learning to put on their own shoes and a good exercise is learning how to string beads. We are always practicing our manners and using our words instead of our bodies to communicate with our friends. We are practicing our songs everyday with our Bumblebee and Caterpillar friends! Happy Holidays and a Happy New Year Caterpillar families! This month we celebrated Georgie’s second birthday! Happy Birthday Georgie!! Our studies this month included learning about different animals in each continent and this is leading us to learn about animals with backbones or vertebrate animals (birds and mammals). In our studies of North America, we are learning about the different landmarks, the Statue of Liberty, White House, Hoover Dam, Mount Rushmore, etc. The children love this work as there are miniatures of each landmark and a matching card for them to match. We are practicing our new letter sound “J”. The children are learning to count 1-10 in different languages and our older Ladybugs are practicing their 1:1 counting (object to symbol) by using the Spindle Boxes (5 spindles have to go to the section with the number 5, for example). We are also learning the life cycle of a pumpkin, doing lots of painting and stamping and working on our Original Artworks masterpieces which will be a surprise to each family! We had our first Earthquake Safety Practice and the children did great practicing Drop, Cover and Hold. We love the new play equipment in the Courtyard and our new Play-yard in the back of the school! In November we will be working on Halloween and Leaf art work as well as studying Trees and Leaves, talking about being thankful and Thanksgiving works. The Ladybugs have been busy getting to know one another, making new friendships and finding their way with the classroom routines and rules. 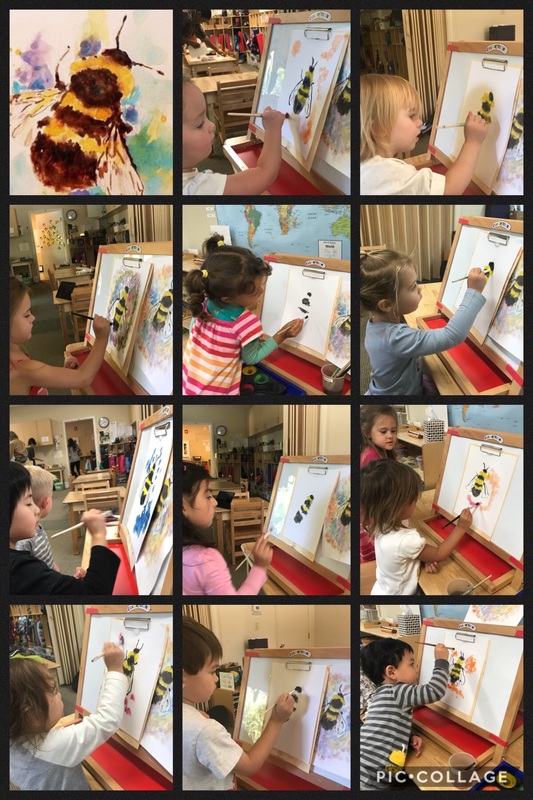 Our returning Ladybugs have been very helpful with the new Ladybugs, showing them how we sit in circle time, where we line up, how the outside materials work and being wonderful role models! We are learning about Grace and Courtesy, saying “please” and “thank-you” and playing with friends. We are having fun in KinderDance, learning how to use our words and sharing. We will be learning about Fall and the Seasons and about the continents, including learning the Continents Song, as well as learning our alphabet, counting and doing lots of art projects! The Caterpillar classroom started our new school year with eight students! We began our year studying the parts of the Caterpillar, making Caterpillar art and reading lots of books about Caterpillars! We reviewed all the routines and classroom rules and got our classroom jobs (pencil sharpener, shelf checker, calendar, etc.). In Language, we studied/reviewed rhyming words, beginning sounds and blending sounds to read. In Math, we studied/reviewed counting to 100, 1:1 correspondence to 10 and above and writing our numbers. We began our study of North America, talking about the animals and making animal books, coloring maps and landmarks. We are now studying apples, their varieties, parts of the apple and will be doing apple tasting. 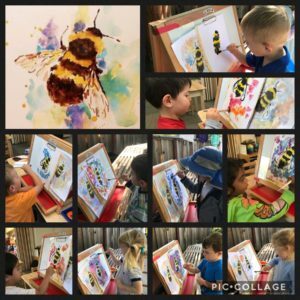 Upcoming studies include Autumn and Seasons, Living and Non-Living things, Plants and Animals, and Air, Land and Water, including our Language, Math, Practical Life, and Sensorial curriculum.